Worried about mistletoe infestations ? 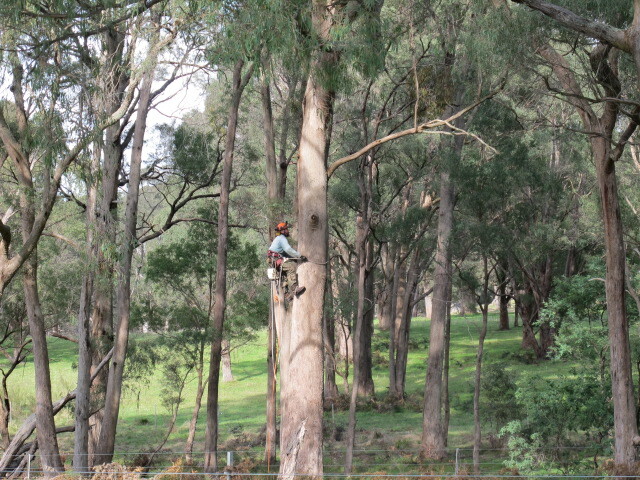 Heavy mistletoe infestations in eucalypt trees are causing concern to local landcare members in the Hughes Creek catchment . Although mistletoe is a very important resource for many animals , large numbers of this parasitic plant can kill the host tree. Many mature narrow leaf peppermints and red stringybarks have been effected by an over burden of mistletoe since the stress of recent droughts reduced their vigour. More than 20 species of native mistletoe occur in eastern Australia. Although they are parasites they are habitat for many animals in rural landscapes . The dense foliage of mistletoe provides good nesting sites for many birds such as noisy friarbirds and leaden flycatchers. Mistletoe produces abundant nectar, fruit and seeds that are eaten by many species of birds and animals including the mistletoe bird . The leaves of mistletoes are food for mammals such as common ringtail possums. AND… speaking of butterflies, Drooping Mistletoe (Amyema pendulum), one of the more common mistletoe species in the wetter forests of the Strathbogies, is the food plant of the Wood White Butterfly. Have a look at the SNAP page on White Butterflies. So, really, all we need is more butterflies – simple!